The boys were named Kengo-kun and Hayao-kun. Mr. and Mrs. M visited LST Kyoto salon last Saturday with their two boys. They got married at Kamigamo shrine on November 22nd in 2010 and keep coming back to visit the shrine and LST Kyoto salon on their wedding anniversary since then. This was their fourth visit. As Mrs. M were pregnant with twins when I saw them last year, I’ve been looking forward to see them with babies. 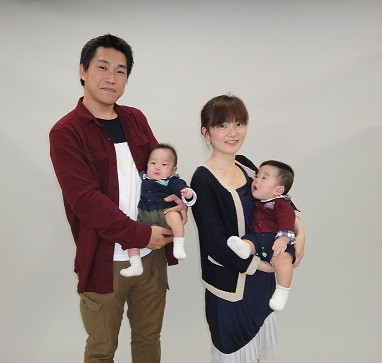 They named “Kengo” in the hope he will grow up in good health and named “Hayao” in the hope he will also grow up together with Kengo. Both names are nice and reflecting their parents’ love. Kengo-kun and Hayao-kun must be walking when we’ll see them next year. We’ll be looking forward to your visit again, Mr. and Mrs. M.
Thank you for visiting us every year!